I recall being a Chemistry major as an undergraduate and learning about chemical reactions. I did an experiment that literally turned my healthy black hair gray! My Professor told me that I did not mix a solution right and changed the pH level of the solution. This caused the wrong chemical reaction. As a young woman who was very into her image, it was a tragedy to see my hair gray and it felt like forever before it would turn back to normal. Further, I never imagined that experiment would be a part of my introductory statement when I speak to people about the importance of understanding the internal chemical reactions going on in our bodies (especially in our digestive systems) and how they can predict our overall health factor. As a Holistic Clean Eating Coach, I look for unique ways to teach my clients and others how to identify their Health IQ. One way to identify it is to use pH strips to measure how acidic and alkaline our bodies are. The higher the pH level the healthier, more alkaline and oxygen rich the body is. The lower the pH level the more acidic and oxygen deprived the fluid is. The pH range is from 0 to 14, with 7.0 being neutral. Anything above 7.0 is alkaline and anything below 7.0 is acidic. Human blood should be above 7.35. If the pH level falls below 7.35 a person will go into go into acidosis. And shockingly, if the blood falls below 7, a person can potentially die. The pH level of the stomach is measured in gastric acid and ranges from 1.5 to 3.5. The body is considered healthy when it is alkaline with a pH above 7. 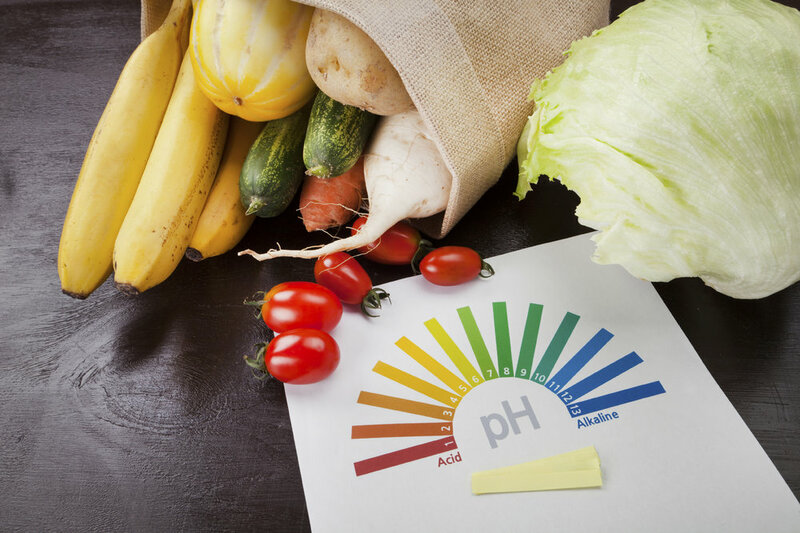 Many Holistic Nutritionists, Natureopathic and Homeopathic Doctors, and others practicing alternative medicine believe there is a correlation between the body's pH level and disease. A diet that is predominantly acid-forming will cause the body to store excess poisons and uric-acid in the form of uric crystals, and deposit them into your bodily tissues and joints. Uric crystals cause pain, such as from arthritis and bursitis, due to their irritating nature, and lead to all kinds of sports and non-sports injuries related to poor, unhealthy, poisoned body tissue. Acidifying diets reduce the oxygen in your blood and tissue, thus, slowing down the repair, regeneration, and maintenance of healthy body tissue. On the other hand, alkaline forming foods are nutrient dense. They enhance the body's immune system allowing it to fight off disease and infection, oxygenate the body, reduce inflammation, help the muscles perform more efficiently, help maintain bone health, and fight free radicals. Add fresh lemon juice to your water. Boost your hydration with a bit of this fruit, or squeeze in onto fresh salads as a dressing. Though outside of the body lemon juice is acidic, inside the body it is alkaline. Every morning I drink warm water with fresh squeezed lemon juice. It is good for digestion and also quickly alkalines my body. I also love the taste of lemon juice so I squeeze it on a lot of my food, especially fresh salads. These two superfoods have benefits that are too numerous to list here. They are oxygen-rich plant substances that are highly alkaline. I put a droplet of highly concentrated chlorophyll in my water and drink it through the day. Both chlorophyll and spirulina also come in powder and pill forms (I will often mix the powder in my protein smoothies and recommend this to people who think they will have green teeth if they put the concentrated chlorophyll in only water). This is highly alkaline even though it tastes very bitter. For those who can't tolerate just drinking 1-2 teaspoons of ACV, consider diluting 1 teaspoon with 2-4 ounces of hot to warm water, a squeeze of lemon juice, and a teaspoon of Organic, raw honey. Drink it as a tea. EnJunaya Canton has been working as a Holistic Clean Eating and Wellness Coach since 2007. She is also the Creator/Owner of GLOW GIRL! Natural Skin Care Products.